This month’s recipe redux challenge is “Get your Veggies in Shape”. We’re showing off summer’s freshest fruits and veggies in shapes like ribbons, noodles, cut-outs, or other creative cuts. I recently got a spiralizer and I am obsessed! Ask my roomie, I have been spiralizing everything! From apples, to carrots, to the sweet potatoes and zucchini I used in my Sweet Potato and Zoodle Pad Thai, it’s all delicious! Plus it’s so fun to use! My sister’s birthday is in July and she loves Thai food! When I heard what the recipe challenge was for this month I was so excited! Not only was I able to use my new spiralizer, I was also able to recipe test with some of her favorite ingredients. 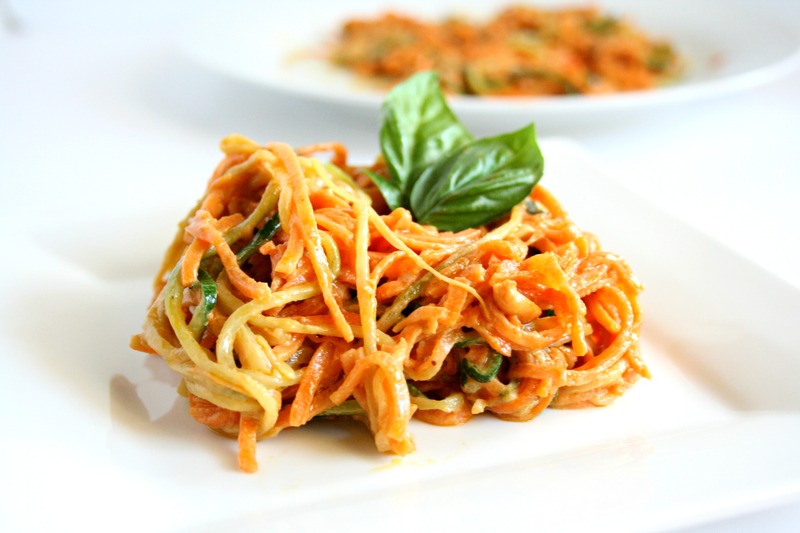 I developed this “healthier” version made with spiralized sweet potatoes and zucchini for my noodles. It’s such a fun way to sneak in some Vitamin C, Vitamin A, potassium, and fiber. I personally prefer these noodles over the traditional Thai noodles! 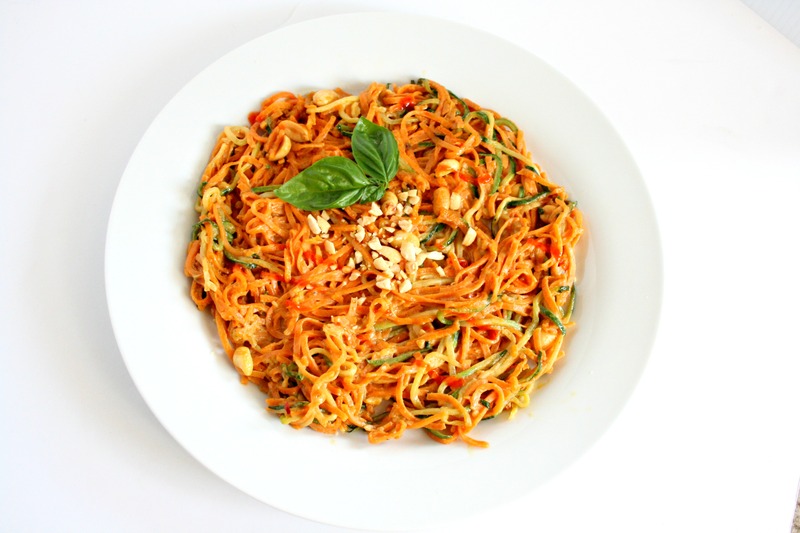 My Sweet Potato Zoodle Pad Thai has everything you love about pad thai. It’s bursting with spicy peanut flavors from the creamy peanut butter sauce, spicy sriracha drizzle, and the crunchy peanuts on top. Make it tonight or pin the recipe for later! In a medium sized bowl, combine peanut butter, rice wine vinegar, soy sauce, honey, sriracha sauce, garlic powder, ginger powder, pepper and water. Spiralize 1 sweet potato and zucchini. Cook for 7 to 9 minutes or until noodles are cooked and golden brown. Toss noodles in the sauce and serve with basil and peanuts. Thank you Siri! You’ll have to let me know what you think! 🙂 It really was! The spiralizers are so easy and fun to use! Oh my gosh this sounds amaze! I just got a spiralizer and I love Pad Thai! P.S. I just got accepted to the BGB Community and found ya through there! I saw you went to Alabama, I went to Auburn!! xoxx! This looks so goood! Can’t wait to give it a try! Delish! I’m always up for Thai food! Same here girl! Same here! Mmmm!Thank you!! This looks so delish! I love Pad Thai even though it’s not the healthiest choice. This is such a great makeover! Oh, Pad Thai is one of my great weaknesses. I love this healthy twist! OMGosh just stumbled apron this recipe sounds so yummy and I have everything on hand. Cant wait to try! BTW how many will this serve? Yayy! Please do and let me know what you think! 🙂 It serves 2 for dinner, but 4 for a fun veggie side! You could easily double the recipe though! What a delicious twist on pad thai! Thanks for sharing this recipe! Let me start by saying this recipe is AMAZING!! It is definitely a staple in our dinner selection rotation and I love that it is a healthier version! However, I have made this a few times and I have trouble with the sauce being creamy enough that it spreads out over the noodles. The peanut butter just seems to congeal everything together and makes it very difficult to spread out. Any suggestions? I’ve tried adding it while over heat to see if it would melt a little bit and be easier to spread and I’ve tried adding a little more water neither seem to work that well. I’m making this for dinner again tonight and would love suggestions! I have experienced a thick sauce, almost more of a paste consistency, but smooth. I will try adding a little bit more water this evening when I make this and see if that helps! Thanks! Adding more water worked! It turned out much more like a dressing by doing that! Also just have to say thank you again for posting the recipe, my husband RAVED about it again last night! I made this today & it was delicious. I did have to add more water to the sauce to make it creamier. I’ll be making this again. Hey Chelsea! Just tried this recipe tonight for dinner and I am OBSESSED. I just bought a spiralizer last week and I was very excited to try it out! I was wondering, what kind of spiralizer do you use? I just bought a cheap one that requires twisting by hand and it was pretty difficult, so I’m wondering if I should look into getting a different one. Hey Lauren! So glad you liked it! 😊 It’s one of my favorites! I have an OXO one that I love! It’s super easy to use and has 3 different blade insert options. I have a hand held one that’s great for zucchini, but the sweet potatoes are hard to do in there! Hope this is helpful!